This is another serious rant so you may as well move on right now. Besides it’s gonna piss most of you off, so just go now, your already miserable day will be more blissful for it. This should really wind them up. My entries on abortion and gun control got a little excitement going on here. People take things so seriously and I feel sorry for them because life isn’t really all that serious an affair. Life is easy. Maximize leisure time. Hang out more with people you care for. Help somebody everyday. I ate, I didn’t get rained on, I slept okay, the rest is what is called luxury. Get as much luxury as you can unless it means the guy next to you doesn’t eat, or gets rained on, or doesn’t have a place to sleep, then we have a problem with you and me having too much luxury and we should spread it around more than a little bit. I call this little rant “Queer Bait” but it probably should be called “Homophobe Bait,” but that isn’t going to grab as many search hits which they say is soooooo important. What’s the deal with Gay Rights? I mean why is it an issue at all? Just treat homosexuals like people, game over. I live in the South and I see a lot of people getting all worked up about excluding gay people from doing what they want to do. Why? Do we come over to your house and tell you not to play “pony girl” or “cop and French maid” or beat your kids. I didn’t think so, so leave people alone to do what they want. In the first place being gay isn’t some lifestyle choice any more than red hair is a lifestyle choice. People are just born with a different groove and find love in different places than we straights do, and I say love is so hard to find these days that anywhere you can find it is practically a miracle and should be celebrated. To say it is an edgy lifestyle choice is to be ignorant of the facts. 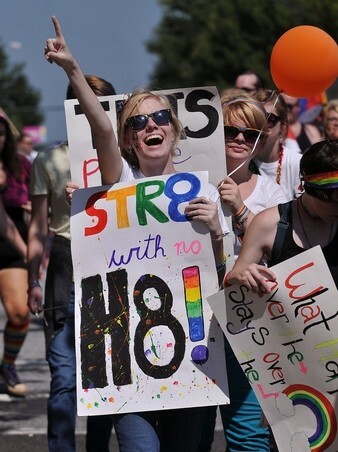 A lot of straight dudes say they can’t stand seeing gays holding hands in public or kissing. Now me, I’m not particularly fond of watching anyone trade saliva in any public context, but just avert your gaze, you certainly don’t have to watch what you don’t like. These same bigots tend to be the ones who don’t mind a little fake lesbian girl-on-girl action on Skinemax so hypocrisy is definitely the word for that day. What is actually the threat to straight males from homosexuals? Do they think it’s contagious. Do they think someone is going to pork them in the locker room? What if a gay man did ask you if you were straight or gay? Shouldn’t you be flattered? 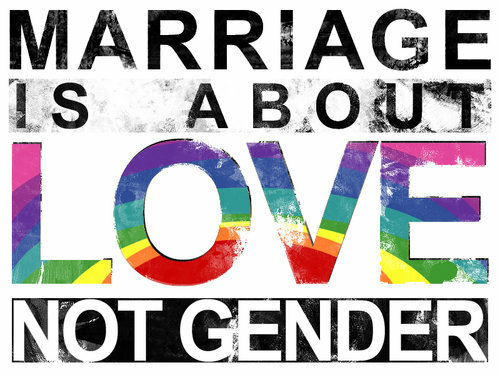 Gay marriage is actually one of the most sensible things. After all gay marriage rarely results in any progeny and is an excellent outlet for all the unwanted children in this world. Unbelievably the same people who oppose abortion are largely the same ones who oppose gay rights and gay marriage and gay adoption. Go figure. The conventional family argument is largely an anachronism today and a poor excuse to oppose gay rights. At least 50% of hetero marriages end in divorce often with children involved and I think out of wedlock births are approaching the same number and growing, so a conventional monogamous long term straight family is in the minority nowadays. 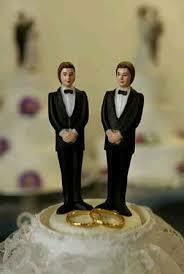 I think we should encourage any kind of stable relationships of the monogamous long term kind, gay or straight. I would bet, but don’t have the statistics to prove it (you know how lazy I am), that gay marriages result in a greater percentage of lasting long term relationships than heterosexual matrimony does. So I say be an activist if you can but at least lay off and be cool about it. Hope you have a Gay day!